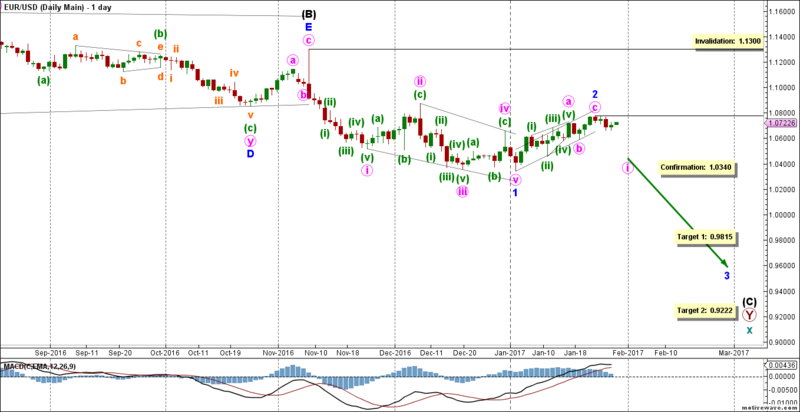 The Euro started the new year by attempting to recover some of the 1,000 pips it had lost in the previous two months. And yet, after four weeks of persistence and perseverance, it has managed to recover only a little less than 50% of its losses over that period. Not only has this rally been weak and choppy, it’s not even carried very well by momentum, which seems to be steadily waning. None of that is a particularly good sign for the Euro. This main count sees that black wave (C) is likely forming an impulse labeled blue waves 1 through 5. Within it, blue wave 1 formed a leading diagonal labeled pink waves i through v.
Blue wave 2 formed a zigzag labeled pink waves a, b and c.
This count expects the euro to move towards the downside in blue wave 3. This will be confirmed by movement below 1.0340. At 0.9815 blue wave 3 would reach 100% the length of blue wave 1, then at 0.9222 it would reach 161.8% of its length. 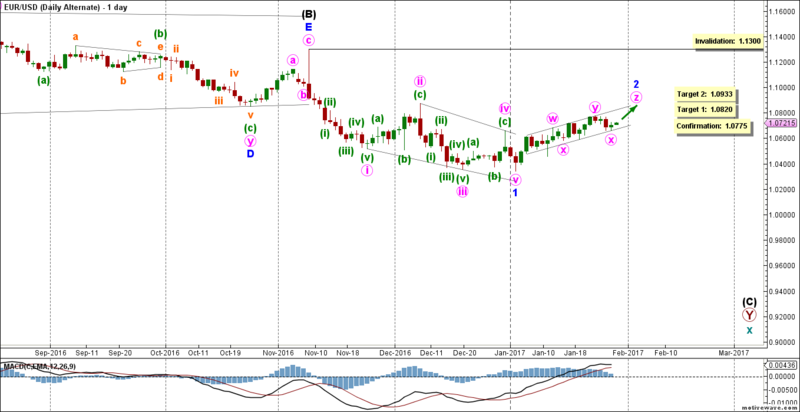 This wave count is invalidated by movement above 1.0775 as pink wave ii may not move beyond the start of pink wave i. This alternate count sees that black wave (C) is likely forming an impulse labeled blue waves 1 through 5. Blue wave 2 is forming a triple zigzag labeled pink waves w, y and z. 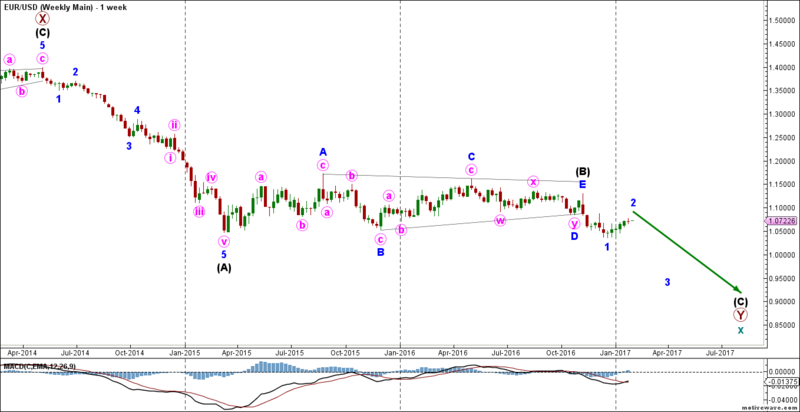 This count expects the euro to continue moving towards the upside in blue wave 2. This will be confirmed by movement above 1.0775. At 1.0820 blue wave 2 would retrace 50% of blue wave 1, then at 1.0933 it would retrace 61.8% of its length.